Your daughter wants to learn to play the guitar and sing like Taylor Swift. Your son wants to learn the drums and the piano. You want music in their lives, and you want to encourage their interest, but you don’t want to buy an expensive guitar, a noisy drum set, and a bulky piano until you know they’re going to stick with it. Choosing your child’s first instrument is a daunting task. Musical instruments and music lessons alike are investments of your time and money. What if you spend hundreds of dollars on a piano, have it delivered, and rearrange your living room to make it fit, only to find your child has lost interest in a few months? Picking the right instrument in the first place can help ensure that your child sticks with lessons for the long haul. At MTMS, we offer lessons for children as young as 3 years of age. In the 3-5 range, we recommend the preschool music class, where children are exposed to singing, piano, drums, guitar, and violin. The more exposure your young child has to a variety of instruments, the more certain he or she will be when it comes time to make a choice and settle into private lessons. 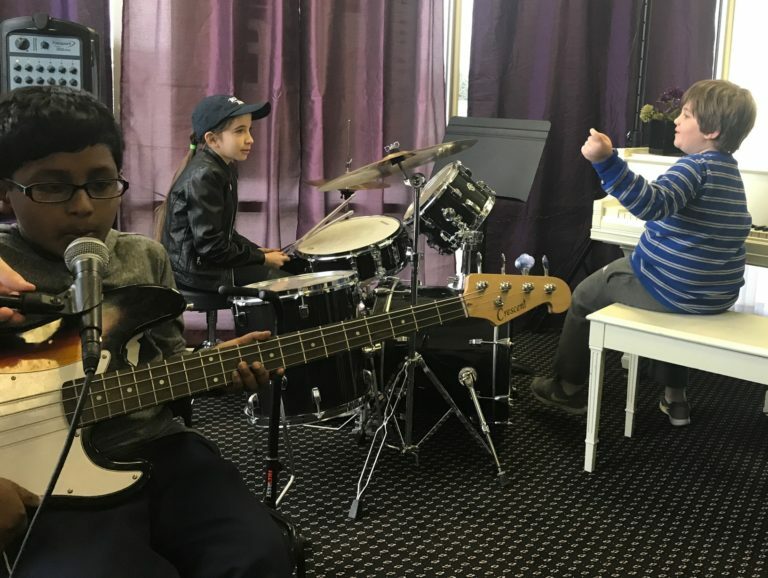 We do also offer private lessons in drum and piano for this age group, but we will first assess your 3-year-old to see if he or she is ready for private lessons. Whatever the age of your child, you should ask him what instrument he would like to play. If the student has expressed an interest in a particular instrument, he will be more likely to practice it at home. We always first encourage students to study the instruments they are willing to practice. If you and your child are not sure which instrument to begin with, but you want some kind of music lessons, we recommend starting with piano. We do not require you to have a full-sized acoustic piano in your home; a keyboard (~$150) or electric piano (~$500) will do. The piano is a good choice for your child’s first instrument because she will learn both treble and bass staffs, as well as the concepts of sharps, flats, scales, and the overall musical alphabet. The piano keyboard demonstrates the patterns inherent in musical pitches, and your child will find it easy to transition from piano to another instrument. Percussion is also a good choice for beginner musicians, and particularly for young beginners. Students love to practice drums, and learning drums will develop rhythm, motor skills, and multi-tasking in your child. At the beginner level, percussion is easier than piano, so it’s a good choice for children who are not as interested in the hard work that piano practice requires. And if you object to the idea of a noisy drum kit in your home, you could opt instead for an electronic drum kit. Try Amazon.com or Sam’s Club for a kit under $200. Provide your child with a pair of headphones to go with the kit, and you’re all set. All you’ll ever hear out of practice time is the light sound of a drumstick bouncing off of a rubber mat. 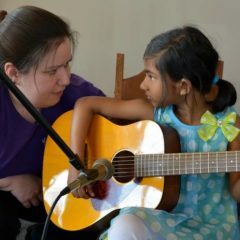 We offer private lessons in guitar and violin for children as young as 5 years old, but keep in mind that these instruments are difficult for little fingers to play. It hurts their fingers to push down on the strings, which leads to fights at practice time. If your young child insists on guitar or violin, we will always encourage the lessons, but we recommend at least making sure you buy the easiest instrument for your child to play. Electric guitars play easier than acoustic guitars because the strings are closer to the fingerboard and are easier to press down. Smaller, child-sized instruments (1/4-size, 1/2-size, or 3/4-size, depending on the size of the child) are easier for your child’s arms and fingers to reach. Voice lessons are another choice for young students. Although the voices of young children are not fully developed, children can learn to stand and breathe properly while singing, to match pitches (or “carry a tune”), to count rhythms and read notes, and to perform in front of an audience. The downside is that voice lessons don’t develop motor skills and multi-tasking as much as learning an instrument would. The upside is that voices are free! You have no expensive instrument in which to invest. In the end, you should pick the instrument that best suits your child’s age and interest and your budget. Happy music making!